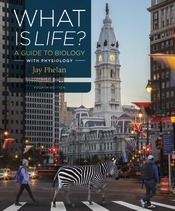 Phelan’s dynamic approach to teaching biology is the driving force behind What Is Life? A Guide to Biology—the most successful new non-majors biology textbook of the millennium. The rigorously updated new edition brings forward the features that made the book a classroom favorite (chapters anchored to intriguing questions about life, spectacular original illustrations, innovative learning tools) with a more focused and flexible presentation and enhanced art.